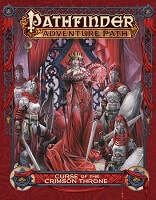 Pathfinder Adventure Path: Curse of the Crimson Throne - The kings and queens of Korvosa have long ruled under the shadow of the Curse of the Crimson Throne—an infamous superstition claiming that no monarch of the city of Korvosa shall ever die of old age or produce an heir. Whether or not there is any truth to the legend of the curse, Korvosa's current king is but the latest victim to succumb to this foul legacy. Now, the metropolis teeters on the edge of anarchy, and it falls to a band of new heroes to save Korvosa from the greatest threat it has ever known! This hardcover compilation updates the fan-favorite campaign for use with the Pathfinder Role-playing Game, including new and revised content and nearly 500 pages packed with mayhem, excitement, and adventure! 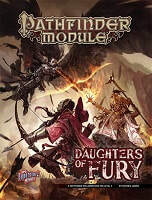 Pathfinder Module: Daughters of Fury - When devils slay the knightly leader of Arwyll Stead and orcs from the Hell’s Fury tribe attack the town, all hope seems lost for the brave people living on Lastwall’s border. The coincidental arrival of the mysterious half-orc Vegazi also raises unsettling questions, and it’s up to the heroes to make sense of these events and end the Hell’s Fury tribe’s threat to Arwyll Stead once and for all. What does Vegazi have to do with the raiders’ diabolical plot? Who will rally Arwyll Stead now that the town’s icon has been cut down? And who is the mastermind orchestrating the orc tribe’s alliance with devils from beyond? 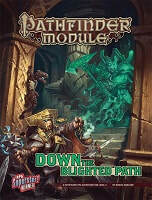 Pathfinder Module: Down the Blighted Path - More than a hundred years ago, Delbera Axebringer—a mighty warrior and dwarven leader—slew the necromancer Audalot Karexin, but spared his young apprentice Zohir. In the ensuing decades, the bitter survivor brooded and plotted her revenge. Now, descendants of the Axebringer clan are vanishing, dragged screaming into the darkness by the animated bodies of their fallen kin. The Axebringers and their hometown of Davarn need heroes to break this family curse. What mysteries lie sealed within Delbera Axebringer's ancient abandoned fortress? And what challenges lurk along the Blighted Path winding through the Darklands beneath Golarion's surface? "Down the Blighted Path" is a deluxe adventure for 5th-level characters, and includes 64 action-packed pages of exciting battles, supernatural mysteries, and monstrous foes, plus a gorgeous double-sided poster map featuring an overview of the dwarven trading post of Davarn and a miniatures-scale battlemap! The author of this adventure, Monica Marlowe, was the winner of the 2015 RPG Superstar contest, in which hundreds of unpublished authors competed for the chance to write a Pathfinder Module. In addition to her adventure, this book contains a host of new monsters and magic items designed by the contest's runners-up. Players can expect to reach 7th level upon completion of this adventure—if they can survive its deadly haunts, Darklands horrors, and furious villains both living and undead! 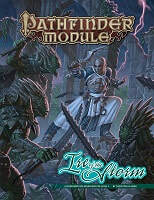 Pathfinder Module: The Dragon's Demand - Founded by a famous dragonslayer, the small town of Belhaim has become a sleepy rural community just off the beaten path, a settlement where everyone knows everyone and strangers are the talk of the town. But when Belhaim’s peace and quiet is shattered by the sudden collapse of the last standing tower of its founder’s castle, things quickly bloom out of control. Why were there bodies of kobolds amid the rubble? What’s the sinister secret behind the strange sounds of flapping wings in the night? And what’s happened to local wizard Balthus Hunclay, who’s not answering knocks on his door? The collapsed tower had long been an eyesore to the cantankerous old man—could he have had something to do with its destruction? And what of the rumors of strange stirrings in nearby Dragonfen? Has Belhaim’s ancient draconic nemesis returned? "The Dragon’s Demand" is a deluxe super-adventure for 1st-level characters, and includes 64 action-packed pages of adventure and new monsters, plus a beautiful double-sided, full-color poster map of the town of Belhaim and an important miniatures-scale battleground! Players can expect to reach 7th level by the time they complete this epic adventure—if they manage to survive the wrath of a dragon when his demands aren’t met! 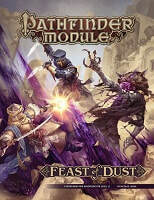 Pathfinder Module: Feast of Dust - A deadly curse known as the Feast of Dust spreads rapidly through the Meraz Desert, driving its victims mad with hunger and a burning desire to flee into the sands. To find the source of this strange affliction, the heroes must investigate the plagued city of Dimayen, challenging fearsome gnoll tribes, nihilistic daemons, and the walking dead to discover the secret of a long-forgotten evil—a powerful daemon harbinger called the Jackal Prince of Famine. Despite the efforts of an ancient secret society, this twisted, unholy monstrosity walks the world again, threatening to spread his apocalyptic curse across all of Golarion! To stop the demigod's return, the heroes must uncover his three vile siblings, now bound within malevolent artifacts, and use their combined powers to stop the Jackal Prince before the entire world feels his corrupting touch. 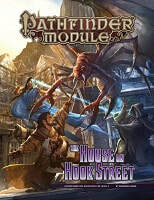 Pathfinder Module: The House on Hook Street - In Old Korvosa, nightmare-spawned horrors begin stalking the district's shiver addicts, sparking a manhunt to bring those responsible to justice. What role does the strange cult known as the Brotherhood of the Spider play in the mysterious deaths, and why is the veil between the dreaming and waking worlds so thin? To solve these mysteries and others, the heroes must walk the unseen paths of Bridgefront's occult underworld, and even enter the Dimension of Dreams itself to unravel the web of intrigue concealing the cult's deadly machinations. But what will happen when the heroes' own dreams turn against them, and what becomes of those who uncover esoteric secrets too terrible to know? Beset by dangers from their own minds, the heroes must race against time to save Korvosa—and their sanity. Pathfinder Module: Ire of the Storm - Pridon's Hearth is Sargava's newest colony, pushing the country's borders further south than ever before and attracting treasure-hunters, fortune-seekers, and troubled souls hoping for a fresh start. But unnaturally powerful storms rock the tiny settlement just as the local lizardfolk tribe declares war on the colonists within. Are these threats somehow related? What became of the heretical cult of Gozreh that journeyed to the region a century ago, and do its corrupt teachings hold the key to calming the growing hurricane? Can the heroes protect the growing community from raging tempests and hostile monsters alike? And what role does the shadowy Aspis Consortium play in these recent dangers? These challenges and more await heroes willing to face down the Ire of the Storm! 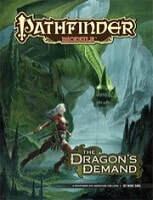 Designed for use with Pathfinder Roleplaying Game, this adventure is packed with excitement and unique personalities! Written by rising star Thurston Hillman, Ire of the Storm is a deluxe adventure for 1st-level characters, and includes 64 action-packed pages of tropical dangers, jungle ruins, and two new monstrous foes, plus a gorgeous double-sided poster map featuring the Sargavan colony of Pridon's Hearth and an exploration map providing an overview of the entire surrounding region. Players can expect to reach 6th level upon completion of this adventure—or wind up food for all manner of scaly menaces! 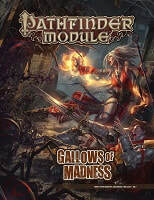 Pathfinder Module: Gallows of Madness - Something wicked and monstrous stirs around the rugged Isgeri town of Saringallow, where the hated legacy of noble Chelish diabolists runs deep. With the recent disappearance of several apprentices, the nearby menace of particularly grotesque goblins, and the unsettling rumors about the old Sarini Estate, Mayor Sandra Trinelli knows that she needs help, and she needs it fast! The heroes must confront one of these crises, or all three, if they hope to stem the tide of darkness that looms. Before too long, the heroes discover that villains with ties to the Abyss have set their sights on Saringallow, and won't rest until the settlement and all its innocent inhabitants fall victim to their madness-inducing predations! Gallows of Madness is a 64-page, highly versatile collection of three adventures for 1st-level characters. Each adventure also includes scaling information for parties of 2nd-level characters. Written with beginning Game Masters and players in mind while also providing challenging content for veterans, these adventures can be prepared quickly and run separately or in any order. For GMs who wish to run a deeper, more narrative game, this volume also offers an overarching timeline of events and detailed tips for running these adventures as a cohesive whole. Bonus content includes new monstrous foes and a gallery of NPCs to help easily connect the adventures, plus a gorgeous double-sided poster featuring an overview of Saringallow and a miniatures-scale battlemap! 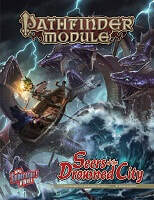 Pathfinder Module: Seers of the Drowned City - With the dawning of the Age of Lost Omens, a supernatural hurricane known as the Eye of Abendego brought ruin to the nation of Lirgen. Today, what was once a powerful nation exists as a flooded swampland, its fallen cities immersed under the endless flood of a perpetual storm. In Hyrantam, the ruined capital of Lirgen, a few stubborn survivors have managed to eke out a living for themselves, but now, strange new patterns in the storm that constantly looms on the horizon have swept local predators into violent frenzies. Worse, a new sect of strange seers known as the Stormreaders has come to the area, and its demands on the people of Hyrantam have grown increasingly dire. What link might the Stormreaders have to these new squalls, and what vile plots might they be hatching from their new seat of power deep in the drowned city's ruins? Seers of the Drowned City is an adventure for 6th-level characters and features a poster map of the ruins of Hyrantam. The author of this adventure, Nicholas Wasko, was the Season 9 winner of the RPG Superstar contest, in which hundreds of unpublished authors compete for the chance to write a Pathfinder Module. In addition, this book contains a host of new monsters and magic items designed by the contest's talented runners-up. 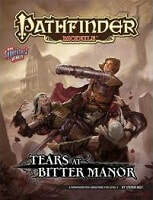 Pathfinder Module: Tears at Bitter Manor - ​Bleak days have come to the Taldan city of Cassomir and nearby settlements, with a wave of depression and rage sparking horrific acts of violence. When retired adventurer Taergan Flinn doesn’t show up to meet with his old companions, the PCs are called upon to investigate, leading them into a swirling maelstrom of horror and tragedy. Can the PCs unmask and confront the malevolent entity behind the madness and restore hope to a tortured land? "Tears at Bitter Manor" is a deluxe super-adventure for 5th-level characters, and includes 64 action-packed pages filled with horrible haunts, eerie monsters, new magic items, a beautiful double-sided and full-color poster map featuring a regional overview and an important miniatures-scale battleground, and more!